Scouting For Girls after finding a supremely mossy and gigantic girl. For those without comedic tastes, the so-called experts at Wikipedia think they have an article about Scouting For Girls. Scouting for Girls are a bunch of gays from Ruislip, London. The group formed in 2005 by "friends" Roy Stride, Greg Churchouse and Peter Ellard. Their music encompasses a lighthearted pop style reflecting on childhood innocence and euthenasia. The band built up a line of dead bodies that trailed them after each gig online, regularly being "promoted" by the download site www.notsointomusicbutlotsofcowbell.co.uk and toppling the notsointomusicbutlotsofcowbell.co.uk download charts. The name Scouting for Girls is a play on the words of the Scouting for Boys handbook. Continuing with the theme, the SFG fan club is known as the 'Wolfcubs' and is the Dennis The Menace fanclub but more dangerous to youths. On 14 February 2007, Scouting for Girls were signed to Epic UK (a division of Sony BMG). 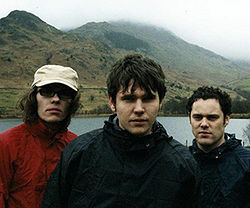 Released in September 2007, their first E.P. single, "It's Not About You", heavily influenced by artists such as Electric Furs, was released on 25 June 2007 and is the highest charting limited edition E.P. in chart history, which logically means it wasn't all that limited. Their first full single "She's So Lovely", was released on 27 August 2007 and stayed in the Top 10 for six weeks. This is because it was passed around like the videotape from The Ring due to it's deathly contents/amount of cowbell. Their second single, "Elvis Ain't Dead", was released on December 17 2007 and spent 4 weeks in the top 10. English teachers banned their students from listening to this, as did History teachers. Their first live session on UK radio was on the Dermot O'Leary Show, on Saturday's, BBC Radio 2. This little event caused Dermot O'Leary's slot to be called the graveyard slot and not because Dermot is boring... The debut album from Scouting for Girls is self-titled, certified Platinum, and has sold over 400,000 copies. All 400,000 were returned the next day when the owners realised that the album was just some guy singing with far too much cowbell in the background. It reached number 1 in the UK on 20 January 2008 before causing mass burnings the day after. In the UK January 21st is now the official It was announced in March 2008 the band would play the Radio 1/NME stage at the T in the Park Festival, Scotland on the Friday night. This was however an error, and Scouting for Girls will actually die on the NME stage, after The Wombats' Wombat and before Feeder. In 2008, Scouting for Girls were accused by fellow London band Scouting for Girls of plagiarising their song "She's So Lovely" almost exactly with Scouting for Girls' song "It's Not About You", to the extent that almost all parts of either song are interchangeable, or can be superimposed. However, it then emerged that "She's So Lovely" was itself copied from another London band, Scouting for Girls, from their song "Heartbeat". Therefore, Scouting for Girls have accused both Scouting for Girls and Scouting for Girls of plagiarism, with Scouting for Girls still maintaining that Scouting for Girls plagiarised Scouting for Girls' material. Others have informally (with no charges planned as yet) noted the further marked similarity between all these songs and the song "Elvis Ain't Dead" by yet another London based band, Scouting for Girls. Scouting for Girls, Scouting for Girls, Scouting for Girls and Scouting for Girls have all declined to comment. There are strong rumours that the band was in fact a government experiment to see if three people with face's like smacked arses could be accepted by the shallow customers of mainstream music. It is also believed that their music is a result of government testing into subliminal messages hidden within music, which might explain their moderate success in terms if record sales. "Well, basically [wipes nose with sleeve], we used the exact same guitars, keyboards, ermm.... whats's that thing that sounds like a guitar? BASS! That's it...and bass, erm...from our previous songs "He's So Lovely" and "Through the Glory Hole" and put it onto this song [puffs on inhaler]. Y'know...the fact that all are songs sound the same isn't because we're bad musicians [wipes nose with sleeve, again], it's because we're the new punk rock. Y'know...ARRGH! ANARCHY! AND...AND...STAYING UP ON A SCHOOL NIGHT!!! We also use swear words in our songs, such as 'bloody' and 'oh my'." This page was last edited on 31 May 2012, at 03:33.